If Juana was expecting happily ever after, she was sorely mistaken. Philip’s interest in his new wife was almost exclusively carnal. The next few years were a tumultuous tug-of-war as Philip was habitually unfaithful and Juana supposedly retaliated with fits of anger and dramatic fainting spells. (See: Why Women Used to Faint So Much) Nevertheless, two kids were popped out fairly quickly, Eleanor in 1498, and Charles in 1500. The following year Ferdinand and Isabella’s only male heir to the crown died. This left Juana as next in line to rule. Thus, while Juana and Philip were visiting Spain, Isabella felt it necessary to school her daughter in the basics of Queenship. Philip scooted back to Flanders the first chance he got. 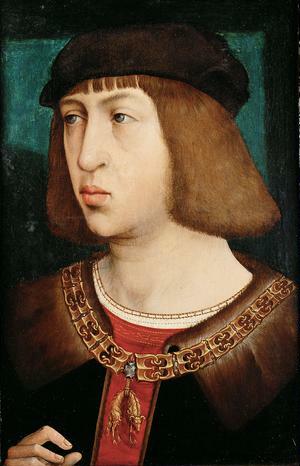 His again pregnant wife stayed behind and ultimately gave birth to another son, Ferdinand, in 1503. In 1504, she returned to Flanders and her Handsome Philip. On her arrival, she discovered her husband had taken a mistress, whose hair she supposedly cut off in a fit of rage. 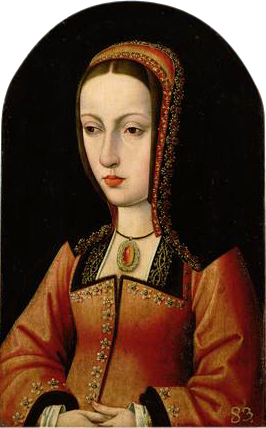 After Isabella’s death in 1504, Juana became Queen of Castile, a fact that didn’t sit well with either her father or husband. Both of them felt they had the right to rule her kingdom, and both thought the best way to get Juana out of the picture was to have her declared insane. Whether she was or not is a matter of some contention. They even went so far as to sign a treaty together, in it noting the queen was not mentally fit to rule. Ultimately Ferdinand left for Aragon, leaving Philip to rule in Juana’s stead. Months later, in 1506, Philip died. The 28-year-old fell ill and expired within a week. It has been speculated that this death may have been aided by poison supplied by his father-in-law Ferdinand, but most historians think he died of typhoid fever. Whatever the case, at the time of Philip’s death, Juana was pregnant for the sixth and final time, in her immediate progeny producing two emperors, Charles V and Ferdinand I, and three queens, Eleanor (Queen of Portugal and France), Isabella (Queen of Denmark, Norway and Sweden), and Mary (Queen of Hungary and Bohemia). Dear Ol’ Dad Ferdinand was more than happy after Philip’s death to take the opportunity to return and take Castile from his daughter. Technically Juana remained queen, with her father acting as regent until his death, at which point her son Charles ruled as co-monarch with her, though she was again out of the picture for all intents and purposes. As for Juana, she was mostly confined to a nunnery for the rest of her long life. If she wasn’t nuts before, she would have ample reason to be so now. She died at age 75, outliving Philip by almost half a century. Dear editor (if there is one) and owner, please replace ludicrous, disrespectful phrases of this kind. Human beings — babies — are not “popped out.” Normal, respectful writers use the word, “born,” in this context. It is not funny, clever, or acceptable to use, “popped out.” It is just plain stupid. Second, perhaps the writer intended to imply that Juana may have lost her sanity by being more-or-less imprisoned and deprived of power … but the clearer implication of the quoted words is that she could have become crazy by being in a convent. That is a sickening insult. The writer probably has no idea that the most healthy women in the world (physically, mentally, and spiritually) are sisters and nuns living in convents. As in so many other articles at this site, the writer has demonstrated her horrendous anti-Catholicism.